A Brunswick icon is set for a new lease of life with local developer Peregrine Projects set to re-purpose the Sarah Sands Hotel into a mixed-use development featuring a new apartment building towards Black St in addition to a hospitality offering within the shell of the old hotel - creating a new food and beverage precinct. Peregrine Projects, bought the site at the corner of Brunswick and Sydney roads for around $6 million in October 2015. The Sarah Sands Hotel which was named after the iconic SS Sarah Sands steam ship which sailed to Melbourne from Liverpool, first opened its doors in 1854 before being renovated and rebranded as Bridie O’Reilly’s Brunswick in 1997. 20 years later it finally closed its doors in preparation for redevelopment. Peregrine Projects in collaboration with heritage consultants Lovell Chen and architects JCB is aiming to "bring Sarah back, better than ever," while also honouring the Sarah Sand's legacy. The $45 million development will comprise 31 bespoke apartments spread across seven floors, "complemented by Melbourne’s finest dining destinations" located within the restored hotel facade. In designing the apartment building, JCB architects have opted for a contrasting grey brick streetwall which draws on the rhythm of the hotels apertures. A highly permeable ground floor interface activates the street corner which flourishes of plantings softening the austere exterior. Above the streetwall, the four-storey 'tower' form is well setback from the existing heritage fabric and streets, appearing recessive in contrast to the hotel. This upper form, is a simple and restrained volume, characterised by a staggering of facade fenestrations, providing the building with a sense of movement and visual interest. The facade of the original Sarah Sands Hotel will be restored to its former glory with the Irish themed - colour scheme making way for a more traditional palette of warm cream and off-white, with black window framing and steel trims. Apartments are available in one, two, and three-bedroom open plan configurations, with one bedroom apartments starting from $440K. 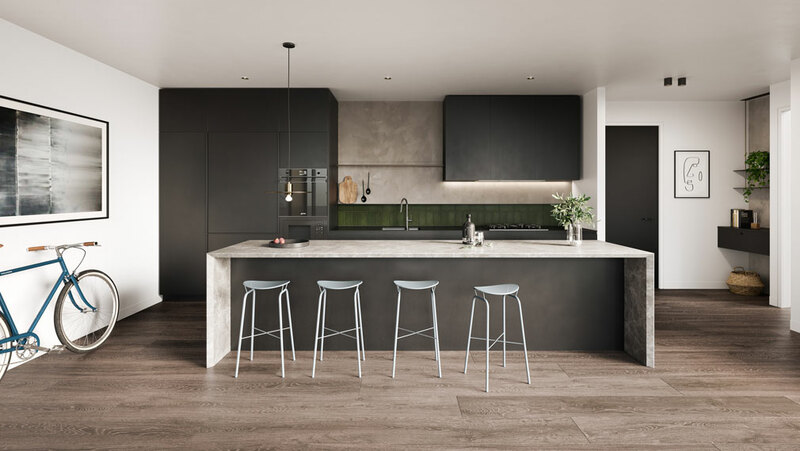 The apartments reflect the neutral colour palette of the exterior, with green handmade tile splashbacks which also provide a splash of colour to the kitchens. Founded and based in Melbourne since 1994, Peregrine Projects aims to create "outstanding properties with a unique point of difference". To achieve this they choose to collaborate with leading architects and consultants, with experience in delivering both commercial and residential projects. The company's close ties to the city's food and beverage scene ensures each new project includes dining destinations which complement the residences. This same approach was adopted for Sarah Sands. Other projects on the cards for Peregrine include Lil'OX in Collingwood, a commercial building at1 75 Burnley Street in Richmond, and a master plan for a 3,000 sqm site on in Langridge Street Collingwood. 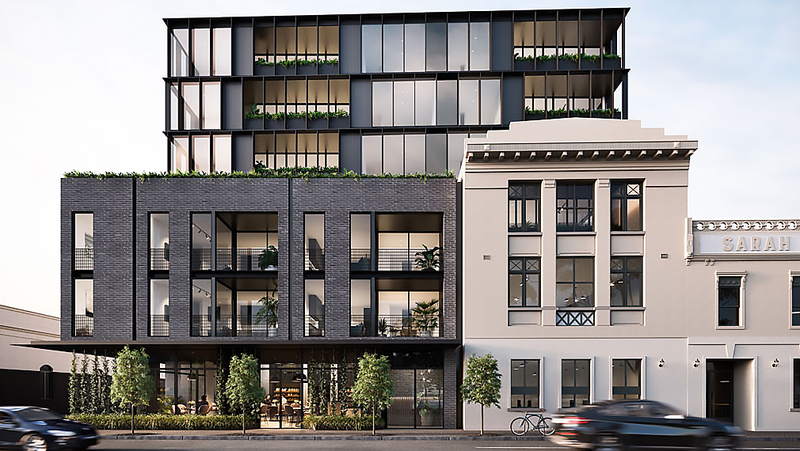 Peregrine are once again teaming up with JCB, to deliver an $80m commercial precinct of six to eight-storeys for the site, which will is also expected to include Melbourne’s first Tribe Hotel. JCB is also working on a scheme for apartments behind the British Crown Hotel in Collingwood, as depicted in the concept render below which appeared on the architects' Instagram account.